From an Atheist Blog. That's funny. Some of our greatest thinkers, scientists, writers, poets, musicians and artists are or were Atheists. They made incredible contributions to mankind and their beliefs were not part of their identity. On the web, however, there are pockets of Atheists that identify themselves as "free thinkers" or "humanists" and they are a very intolerant, acerbic lot. These angry atheists act like childish bullies. On the Saturday before Easter, I had an especially amusing "discourse", if you want to call it that, with a handful of Atheists on Twitter. It went on for hours and brought a lot of traffic to this blog. I'll explain more in a minute. Right now, though, I'll give you a little history of my involvement with Atheists and Atheism on the web. About three years ago, I was doing some research for a Bible study class I was taking. I stumbled upon a list titled "50 Reasons Why God Doesn't Exist" - it turned out to be eight reasons, just rewritten differently. This list led me to a site call: "Why Won't God Heal Amputees?" (WWGHA) There, I signed up for the forum. On my first visit, I learned that you better wear Teflon if you plan on sticking around. Just being identified as a Christian provoked quite a bit of wrath from the more vocal members in the forum. I also learned that if I was going to come back, I better do my homework. Many of the regulars on this forum were former priests, ministers or deeply religious individuals. They knew their Bible and Bible history very well. You could not be naive about the Bible or its history and last more than five seconds in this forum. So, it forced me to study. I had to get up to speed, just to stand up for a day. One of the first things I observed in this forum was that any mention of the word "faith" totally discredited you. Faith was a four-letter word there. And you were going to hear, "PROVE IT," over and over and over, again. Harsh mocking was also part of this non-theistic stew. Ironically, there were a number of very well educated Christians that hung out in this forum on a daily basis. It was interesting to watch two highly educated people on different ends of the spectrum duke it out for an hour. In the end, the Atheists always seemed to turn the argument into personal attacks, degrade their opponent, mock him and then ignore him. I saw this pattern repeat itself over and over for a period of six months or so. During the half year I hung around that forum on a daily basis, there were some very fascinating discussions. Physicists and Thermodynamics experts were the most interesting. The number one questions was about the origin of the universe. How do you get something from nothing? And if there is a God, who created him? When the brilliant scientists were engaged in a serious debate, there was no mocking or taunting by even the most crude of the participants in the forum. This was heady stuff and we all knew it was a privilege to be witness to it. But once the geniuses left their computers, the hecklers and bullies returned to prominence. Unfortunately, the geniuses were busy being geniuses and didn't spend as much time in the forum as I would have liked. Narcissistic, single-minded "free thinkers" just waited for new Christians to show up and then beat them to a pulp. Isn't there something in the "Humanistic Code" about respecting other people? There is, but then the Humanistic Code also nullifies that by later saying don't believe in superstition - in other words, squash the believers. After six months of participating in this forum, I had had enough. Watching these "free thinkers" pound singular ideas and nit-pick details to death, and then virtual high-fiving each other after they had killed another Christian was really boring. I had to go. It seemed like childish behavior in a schoolyard, not a forum of intellectual debate. And I left a message to that effect and canceled my account in the forum. Now... we've finally made it to this past Saturday. This Sunday on Easter, Christians all over the world will celebrate the resurrection of Jesus Christ from the dead. Whether Jesus is your Savior or you think the Jesus story is like the Cat In The Hat, you should still take time to reflect about the message the story of Jesus tells - even for atheists. I thought the message had mass appeal. As usual, I shared my post on Facebook and then sent out a tweet on Twitter with hashtags of #Atheism #God #Christian #Jesus and a few others. The next thing I know is I'm being attacked by this woman from England on Twitter - @RosaRubicondior. Her first questions were about me proving that Jesus existed. I replied by saying that Jesus was mentioned by a historian of his time. I was referring to the writings of Josephus. Another Twitter-based Atheist @GOVManslaughter chimes in that Josephus wrote about Jesus over 20 years after Jesus supposed death. "Still no proof of your Jesus" both of these two hurled at me. First off, I wasn't trying to prove or disprove the existence of Jesus. I wasn't trying to convert anyone. I was trying to promote a blog post about Jesus' message of "love one another" and leave it at that. No, it wasn't going to end there. @RosaRubicondior started grilling me over and over, "Why did you lie that Josephus was from Jesus time?" "Why do you use lies to promote yourself?" "Why are you so dishonest?" "Why do you have to lie?" She would not let up. I kept repeating, "That was not my point. And I don't care." Each time I replied to her and to @GOVManslaughter, however, I included the link to my blog post and used the Twitter hashtags of #Atheism #Atheist #God and others. Hits to my blog soared. There's nothing like a good fight on the Internet to draw a crowd, and I knew that. (Let that be a lesson to you Internet marketers - controversy and conflict cause interest a la Charlie Sheen) So, I kept saying, "I don't care, just read my blog [LINK]" "Believe what you want [LINK]" "Take your meds [LINK]"
This exchange went on for an hour or two. @RosaRubicondior would say that she was using me to prove her point. I told her I was using her to get traffic to my blog. Only two other Atheists ever joined the fray to support her, but I got hundreds of hits on my blog that I probably would not have gotten if it weren't for this crazy lady in England. Thank you. When I told her the hits on my blog were soaring, she said I was scum for driving people to my "e-begging site" - hilarious. With all the hits to that post, I expected the comments to be full of degrading remarks and insults. But there weren't ANY comments. Lots of visitors, but not one comment. Sunday, a regular visitor to my blog who has commented before left something and wrote of his Atheism. I replied to him with dignity and respect. Not something I was getting from @RosaRubicondior or @GOVManslaughter. I don't know how long @RosaRubicondior has had her Twitter account, but she has about 1,600 followers and she's made over 38,000 tweets. Yes, that's right THIRTY-EIGHT THOUSAND. I guess she's engaged in this kind of activity quite a bit. She finally said, "I've used you enough today" - as if she was the victor. Ha! @GOVManslaughter picked up where she left off. @GOVManslaughter I'm bipolar, have Anxiety disorder and I have ADD... and I'm blind in one eye. Thanks for the bigot comment. #Atheism nice. Brits like the word bigot whenever you piss them off. I learned a long time ago, if you have to resort to calling the other person names in a discussion, you've already lost the argument. I've been called a lot of names by Atheists. 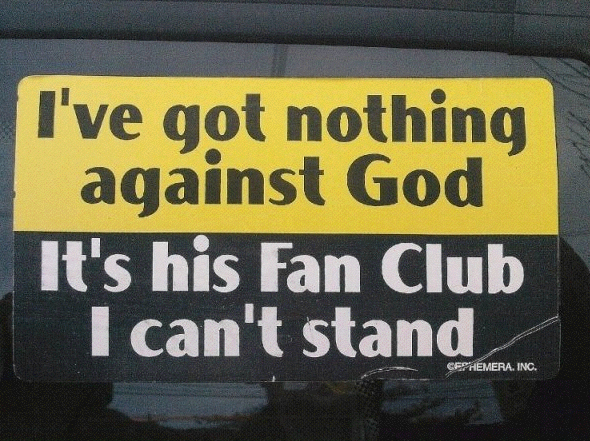 Atheists love to label you, too. One of the favorites of @RosaRubicondior was that I was a CREATIONIST - Oooooh... you're hurting me. LOL. @RosaRubicondior/condescending-bigot People who pretend to be superior by talking down, using religion as their excuse. Hey, there's that BIGOT compliment again. The only condescending remark I made the entire time was to tell her to take her medications a couple times. And we're talking about and exchange of a couple hundred tweets from each of us. Who was condescending and bigoted? You decide. I'm just the messenger. And Jesus did say, "Love one another" - even if you think it is a fairy tale. In the end, my Saturday on Twitter wasn't much different than the days of "Why Won't God Heal Amputees?" 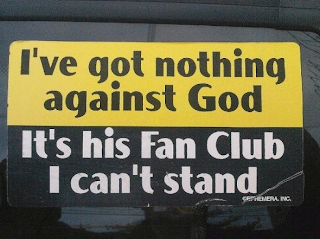 Angry atheists act like childish bullies - and I'm sticking to it. If you enjoyed this article, please share it with friends, using the buttons below. Comments are welcome. I find religion on the Internet pretty amusing when people go at it. I usually watch from the sidelines...usually. I think both sides are right, and both are wrong at the same time. I think evolution and creation can co-exist. I don't buy into that whole saving thing, even though I've been baptized 3 times. Yes, once just wasn't enough to confirm my now-dead faith. The thing that strikes me the most is that this happens on a two-way street. You have those that bang the bible saying "this is the way, or your going to hell". You have those that say the bible is cockamamie bs and if you believe it to be the exacting truth, you're an idiot. I believe there's a lot of truth in the bible...I also believe there's a lot of truth in atheism also. I don't think any side actually has it right. In my mind, there can be a big bang, evolution and a God all co-existing together in harmony. Of course, this requires that the religious give up certain ideas about their faith, and the atheists also give up certain things they believe are true. I guess my point is, we are a young species, and we don't know everything...so how can we, one way or another say that "THIS IS THE TRUTH?". I don't see how that's possible...when we certainly don't have all the facts. Don't ask me to prove it. Either you get what I'm saying, or you don't (that's not just for you, Roger hahahaha). I enjoyed this post, Roger. Hopefully your utterances will hit the right eyeballs and ears. Those whack-jobs that believe so hard-core one way or another are the real problem when talking about religion. Wayne, wait until Tuesday. I'm going after the Fundamentalist Christians. Should be fun for all. I'll put the FUN in Fundamentalist - at least from my viewpoint. It's hilarious that you were unable to provide a single piece of evidence to support your accusations, in a blog in which you complained about people pointing out your lies. I wonder if your readers can work out why that was - if you ever find the integrity to release this comment, of course.